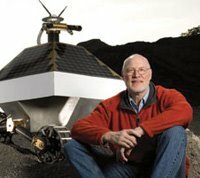 In this episode, we take-off for the moon with Prof. William “Red” Whittaker who is the director of the Field Robotics Center at Carnegie Mellon University in the US. Strong of his victory at the Darpa Urban Challenge and its autonomous cars, Red is now pursuing an endeavor which seems even more out of reach. His team is currently working on sending a privately funded robot to the moon, and then having the robot travel on its surface and transmit video, images and data back to the Earth. The first team to reach the moon will be awarded a juicy $20 million Google Lunar X Prize. Prof. William “Red” Whittaker, who simply goes by the name “Red”, is the Fredkin Professor of Robotics, Director of the Field Robotics Center, and founder of the National Robotics Engineering Consortium, all at Carnegie Mellon University . He is also the Chief Scientist of RedZone Robotics. Red has been a driving force in field robotics, bringing robots out of the lab and into natural environments such as mines, volcano interiors, farms, nuclear facilities, hazardous waste sites and now outer space. One of his best known robots is an autonomous car capable of navigating in urban environments and even traffic. The car drove his TARTAN racing team to victory in the 2007 Darpa Urban Challenge. In this episode he presents his new endeavor: developing a lunar robot named “RED Rover”, capable of reaching the moon, traveling on its surface and transmitting data to Earth. He’ll be competing against many different teams from around the world to be the first to win the $20 million Google Lunar X Prize. Do you think a privately-funded team will land a robot on the moon and win the Google Lunar X-Prize by 2014? The Google Lunar X-Prize is the latest competition sponsored by the X Prize foundation who’s aim is to promote private-sector involvement in science that has been traditionally sponsored by large governments. The goal of this contest is to build a robot that can “safely land on the moon, travel 500 meters over the lunar surface, and send images and data back to the Earth.” Sponsored by Google this time around, the first successful privately-funded team will win a prize of $20 million! The challenge is tough however and the deadline short, with the full prize only available until the end of 2012 and a final deadline of 2014 for a reduced prize. What do you think, will the teams be able to accomplish this daunting task? Take a look at the teams and then vote! Visit the Robots Forum for more information, discussion and videos on this week’s news, including Adam, the robot scientist, silent UAVs and Honda’s new brain machine interface!